44/98 David Mumpower What seems like a 24 knockoff on the surface offers some inventive sequences but doesn't add up to much in the end. 171/196 Max Braden Totally lacking in believability, but the pace and wild car chase help keep your attention. Vantage Point examines the potential fallout that can occur when global terror takes place. 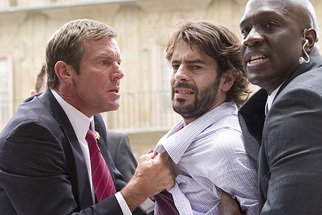 Dennis Quaid and Lost's Matthew Fox star as Secret Service agents who are charged with protecting the President of the United States (William Hurt). When he heads overseas to Spain to attend an important summit about the global war on terror, the president is shot within moments of his arrival in the foreign land. Naturally, things become chaotic very quickly. See the latest developments for this project on the Vantage Point Movie News page.